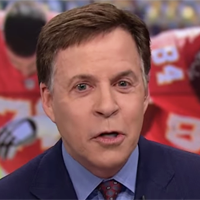 Bob Costas: Networks kowtow to the NFL because "it’s the biggest thing on American TV"
Fresh off his exit from NBC after 40 years, Costas spoke about the unusual business dynamic between TV networks and sports leagues, particularly the NFL. "In general, the relationship between television and sports is the only business I can think of where the buyer must continually flatter the seller," Costas said on ESPN Radio's The Bernie Miklasz Show. "Especially when it comes to the NFL, which is not only the king of all sports, but is the king of all entertainment. It’s the biggest thing in American television, no matter what. You take a look at the top-20 programs for a season, the Academy Awards sneaks in there and maybe a couple other things, but like 16 or 17 of them are NFL games and it’s always topped by the conference championships and the Super Bowl.” Referring to NFL Commissioner Roger Goodell, Costas added: "So, it’s almost a case of, ‘Hey, we’ll pull up to Park Avenue in a Brink’s armored truck, and we’ll deliver the billion dollars to you, Mr. Goodell. But, please, if it’s the wrong denominations, we’re on bended knee begging your forgiveness. We’ll be right back with the bills that you want for the billion dollars!’ That’s the way it is."